The story of Arang and the Magistrate was first recorded in 1920 by Yamasaki Nichijo in Miryang City and published in Chosen Kidan to Tensetsu. However the folktale of Arang existed centuries before Nichijo recorded the tale for posterity’s sake. The tale of the virgin ghost is set during the reign of King Myeongjong (1545-1567) in the Miryang region, Gyeongsangnam-do Province. As the story goes there is a now neglected shrine in Miryang, beneath the Yongnam-nu tower on the banks of the Nam-chon river called Arang-gak. This shrine is dedicated to the spirit of the magistrate’s daughter, the spirit of a girl wronged by those she trusted the most. The girl we know as Arang had a surname of Yun and a childhood nickname of Zong-Og (translation ‘Chaste Jade’). Arang had lost her mother at an early age and found herself dependent on a wet nurse, the only motherly figure she knew. Arang’s father was a nobleman of Seoul, as her only surviving parent she was extremely close to her father. One day Arang’s father found himself appointed to the office of magistrate in Miryang. As a dutiful subject Arang’s father relocated to Miryang, taking his then 18 year old daughter and her wet nurse (now care taker) with him. Once the young girl was situated in this new city the legends of her beauty began to spread among the Miryang noblemen and peasants. Arang was an intelligent girl, excelling at classics. She was beautiful, happy, and pleasant. Soon many suitors came to see the magistrate’s daughter. All of Arang’s suitors were turned away by her father, none of them deemed satisfactory for his only child. This continued until Arang turned 19, her beauty still whispered of in Miryang, Arang continued to spend her days with her wet nurse in seclusion, avoiding her suitors. A man of low rank, Beg Ga, was not deterred by a Father’s rejection or Arang’s seclusion. Be Ga had been bewitched from the moment he had first laid eyes on the pretty girl; he was not to be driven away. Resolute Beg Ga made friends with Arang’s wet nurse; slowly building up an advantageous friendship with the woman who was closest to the pretty magistrate’s daughter. 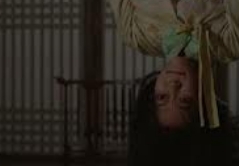 Eventually Be Ga’s persistence and scheming paid off; he was successful in convincing the wet nurse that it was in Arang’s best interest to meet him. As the full moon rose in the night sky Arang sat in her reading room, quietly studying the classics. Arang’s wet nurse suddenly entered, smiling at the young girl. The wet nurse suggested that Arang take a stroll and enjoy the moonlight. Returning her wet nurses smiles the girl willingly dismissed her studies and strolled to the garden near the Yongan Nu Tower. The young girl breathed in the refreshing night air and smiled at her nurse. She was thankful for the break from the classical literature she had been studying for many hours. Finally Arang’s nurse suggested she begin to climb the Yongan Nu pavilion. Innocently Arang complied, following her nurse upwards. Finally at the top, Arang turned towards the moon, staring skyward in appreciation, Arang was unaware that her nurse had slipped away. Without warning Beg Ga appeared, having arranged the meeting with the wet nurse. Beg Ga was eager to have Arang for himself, so eager he leapt upon the girl. Arang began to scream and struggle in the face of the assault. Beg Ga panicked and drew his knife, within a few seconds it was over. He had silenced Arang with his blade. Panicking at his violent act Beg Ga threw Arang’s body from the tower to the bamboo forest below. Arang’s father realized his daughter was missing the next morning. He began a thorough search for his child that turned up no evidence of her whereabouts. Finally Arang’s father was transferred to become a Magistrate elsewhere. After Arang’s father left there were many replacement magistrates in quick succession, all of which died on their first night in office. Whispers of a ghost spread through Miryang, something was definitely going on. The Miryang Magistrate’s position was a curse according to those in Seoul. That is until a young man stepped up, volunteering for the job. The magistrate watched the ghost disappear and remembered her words. The next day Beg Ga visited the magistrate’s office to welcome the new magistrate. True to the ghosts words a yellow moth flew over Beg Ga’s back as he greeted the new magistrate. Sang Sa ordered Beg Ga detained and soon received a full confession from the official. Sang Sa sentenced Beg Ga to death and then set out to find Arang. After some searching he found her body in the bamboo forest under the tower. Arang was given a proper funeral and Beg Ga was punished for his crime. After the funeral Arang no longer appeared in Miryang. The people of the city set up a shrine to the virgin ghost Arang at the foot of the tower, a place where towns’ people prayed and held a yearly festival to avert disasters and misfortunes. The shrine, called Arang gak, is now an overgrown place, the tale of Arang lost to time. Grayson, James H. Myths and Legends from Korea: An Annotated Compendium of Ancient and Modern Materials. N.p. : Psychology, 2000. Print. Zong, In-Sob. Folk Tales from Korea: Collected and Translated by Zong In-Sǒb, .. Seoul: Hollym Corporation, 1970. Print. Illes, Judika. ]Encyclopedia of Spirits: The Ultimate Guide to the Magic of Fairies,Genies,Demons,Ghosts,Gods & Goddesses: Judika Illes: Harpers Collins, 2009. Print.